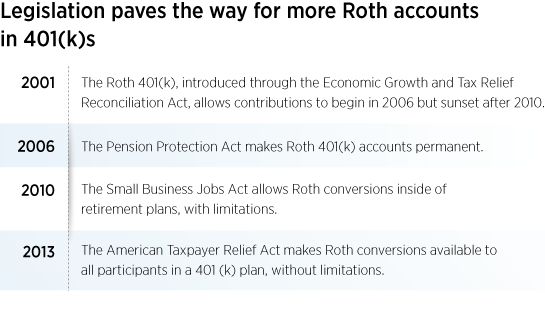 Is using a Roth in a 401(k) plan right for your clients? The use of the Roth IRA has increased dramatically since its introduction in 1997, following passage of the Taxpayer Relief Act. Assets in Roth IRAs more than quadrupled in the past decade to $420 billion in 2012, held by nearly 20 million households, according to the Investment Company Institute. Most recently, the IRS reported a ten-fold increase in the amount of Roth IRA conversions, driven largely by tax law changes, making it easier to convert. A number of tax law changes have provided participants within retirement plans with the opportunity to utilize Roth accounts. The Roth IRA, which allows for tax-free withdrawals in retirement, can play a key role in tax diversification. Conversations around strategies, such as Roth accounts within employer retirement plans, can open the doors to broader investment, retirement, and income opportunities. For example, clients may be looking to consolidate and simplify retirement accounts, leading to IRA transfers and rollovers from retirement plans. Participants without access to Roth accounts within their retirement plan may consider in-service distributions (if available) to a Rollover IRA for subsequent conversion to a Roth IRA. Small business owners or sole proprietors, especially those with a large portion of their savings in traditional tax-deferred accounts, may be interested in establishing a retirement plan with the Roth 401(k) option to build a source of tax-free income for retirement. Those clients seeking to access a Roth strategy within their workplace savings plan, or pursue a Roth conversion, should meet with an advisor to understand how this strategy may benefit their retirement income planning goals.